These days, it seems like everyone (Climate included!) is trying to sell you satellite, UAV or other aerial images of your field. Imagery helps you see variability across your fields. You can see how your crop is performing compared to last year, and you can see how changes in practices (for example, a fungicide application) are helping your crop. 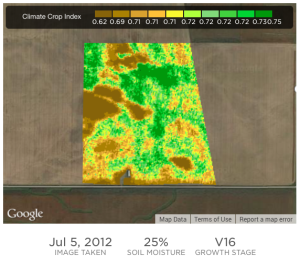 In addition, you can use imagery to identify potential trouble spots and help you figure out where to scout. 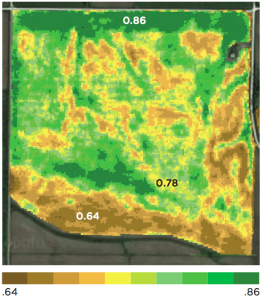 Whether you are looking at NDVI, GBI or CCI, here are four tips to help you get the most out of your imagery. Red / Brown Possible crop emergence problems (e.g. excess moisture). Consider scouting. Lower level of biomass may indicate problems (e.g. insects, drought, lack of nitrogen, etc). Consider scouting. Lower levels of biomass will lead to reduced relative yield. Consider scouting. Yellow / Light green Average levels of biomass. No need to scout. Dark green Possible weed pressure. Consider scouting. Consider scouting dark spots (e.g. weed pressure). Uniform greens show high levels of biomass and good crop health. Sometimes there are little things that increase the variability in the image. For example, a drainage ditch with weeds growing in it will often generate dark green colors with values up in the 0.9 range. It goes without saying that no one knows your fields better than you, so it’s always a good idea to check the more extreme spots with your own eyes. The beauty of these images is that they always show a variation in colors. The tricky thing is that often the degree of variation changes from image to image. Thus red / brown in one image does not always mean the same thing as red /brown in the next image. 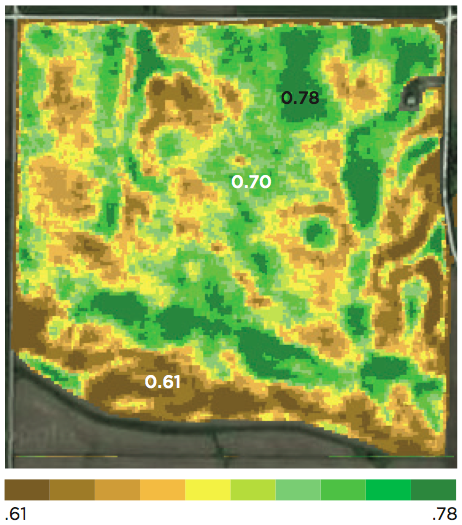 Generally red/brown means less biomass compared to other areas of your fields. It doesn’t necessarily mean you have a critical problem, but it does mean it’s an area worth looking at. Usually it helps to start by looking at the index to double check whether the image is showing a lot of variance or a little variance. A narrow range – e.g. 0.78 – 0.81 – means that the field is showing lots of green plants with small levels of variation. A wide range – e.g. 0.5 – 0.9 – means there are probably some green plants as well as some unhealthier ones or bare patches. Most companies offer you a series of historical images of your fields as well as in-season images. It’s helpful to look at similar timeframes from previous years so that you can get a feel for how similar or different the season is. In addition, comparing years helps you see persistent trends – for example, maybe there is a compacted area of the field where you always have less healthy plants. Or perhaps it’s an area with a different soil type that could benefit from variable rate seeding. Does the field have serious problems? Or is the image just showing small differences? Is the variation the same as previous years? Or new this year? Can the variation be explained by something you know about the field (e.g. soil type, slope, hybrid changes, etc)? Are there particular areas of the field I want to scout? Is the problem area due to seasonal factors, e.g. too much moisture? germination problems? weed pressure? Or is it due to a field condition (e.g. lack of drainage or compaction)? 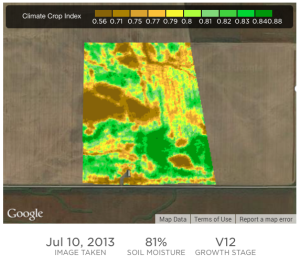 Can the problem be fixed and have a positive impact on yield this season? Is this area worth scouting again? If so, when? We’d love to hear your tips on how you use imagery of your fields. Please share them with us at feedback@climate.com or post them below.